Happy Halloween! I absolutely love fall. I wouldn’t actually say that we have much of a fall season, but I love it just the same. While some people are starting to bundle up, we are finally getting temps down in the 80s. The kids take this as their cue to spend every available second playing outside. I don’t usually decorate for fall. I don’t know why. It’s just one of those things that never happens. 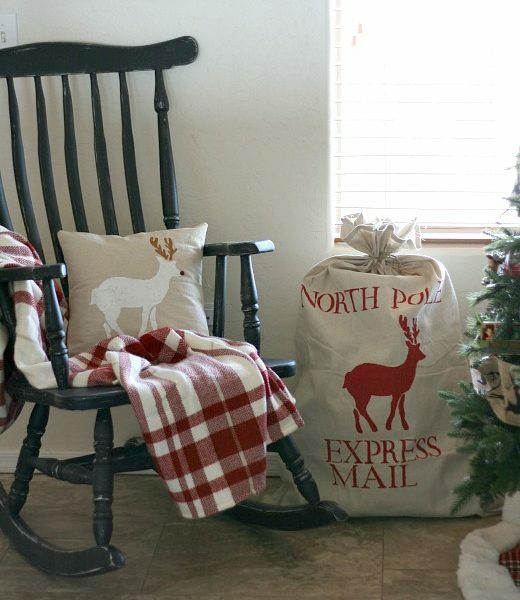 I always save all of my energy to deck our halls for Christmas. 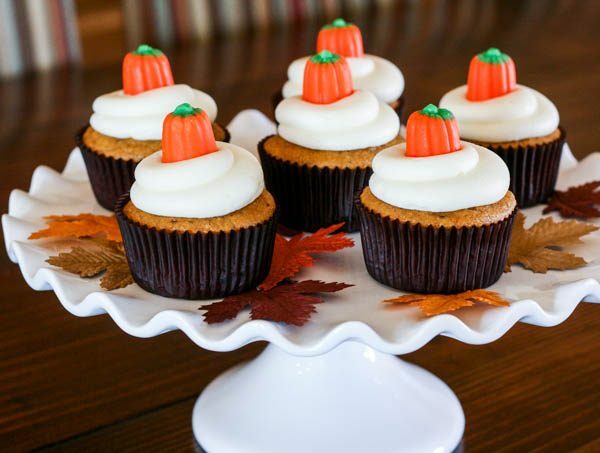 This year, I’ve decided to stop neglecting fall and started by creating this super easy centerpiece. We built a big farmhouse table a few months back and I wanted a rustic centerpiece to compliment it. I love the look of the beautiful, elaborate centerpieces, but we don’t have a formal dining room. We eat off of this table every day, so I needed something more practical that I could easily move to clean off the table after meals. I knew I wanted to use mason jars, so I started by building a box to hold them out of scrap wood that I had. 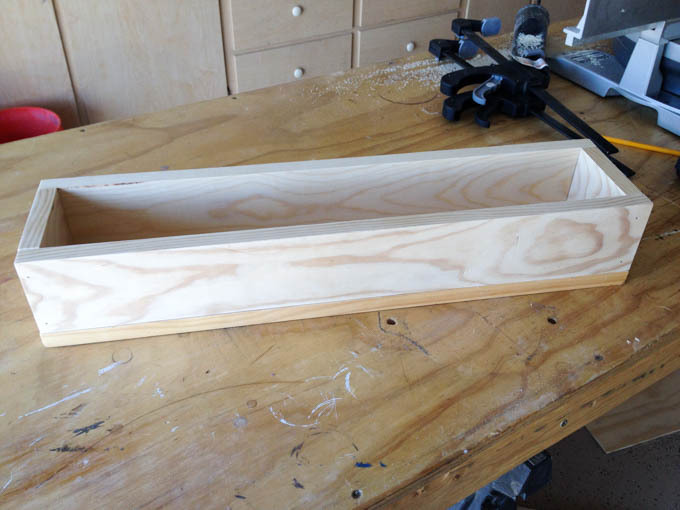 I cut a 1×6 down to 24″ long for the base. I also cut two 1x4s at 24″ for the sides. 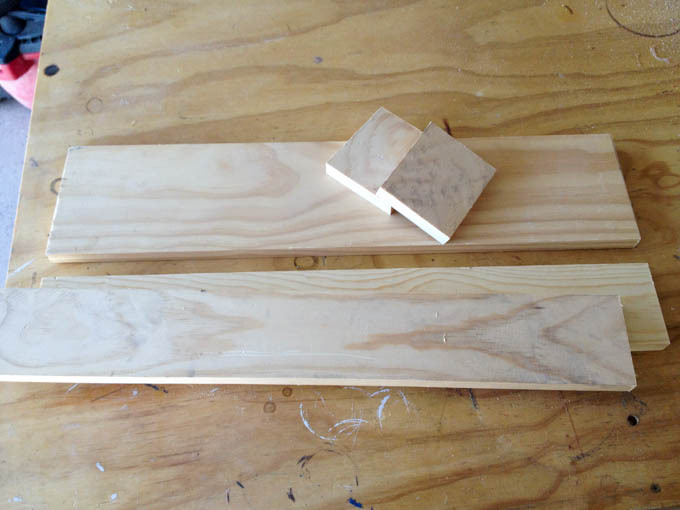 For the ends, I cut two 1x4s at 4″ long. 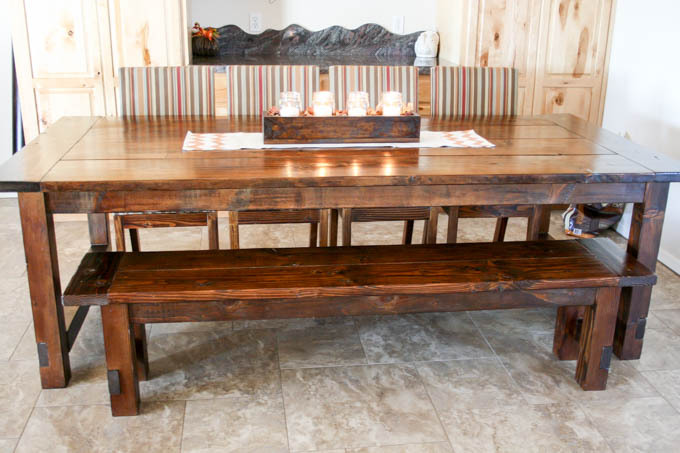 I nailed the pieces together with 1 1/4″ brad nails and stained it with Minwax stain in Provencial (it’s the same color we used on our farmhouse table). Since I stained the box the same color as the table, I knew I needed to put it on a table runner. I bought a 4’x5′ drop cloth from Lowes for around $5. 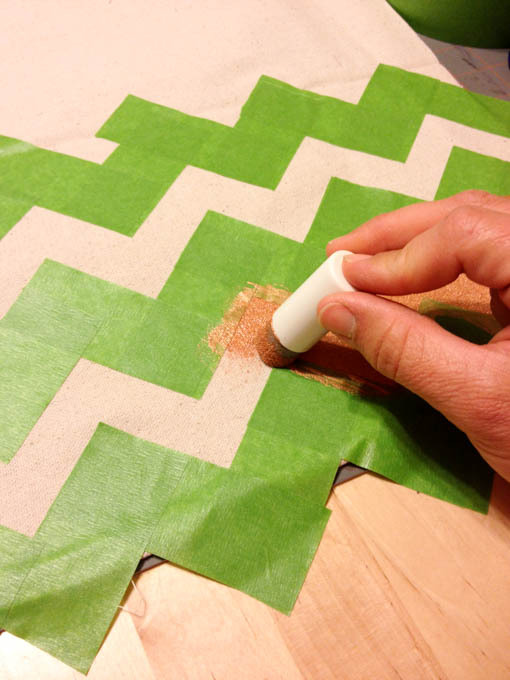 I took the easy lazy way out and just cut a 12″ wide section across the drop cloth. This yielded a 12×48″ table runner. 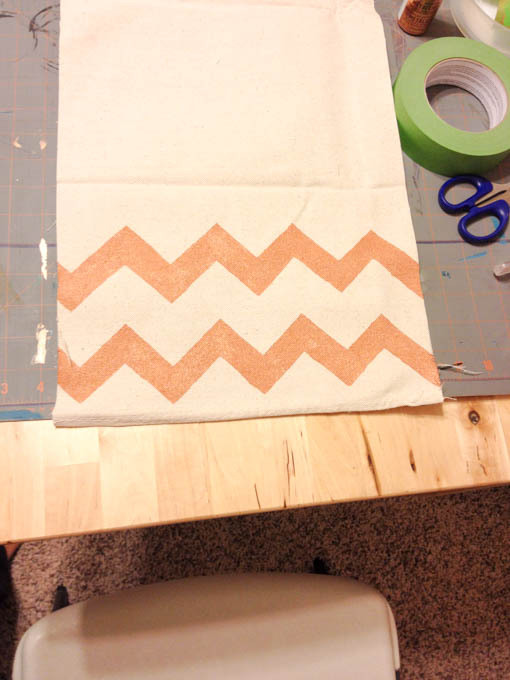 I wanted to have a chevron design, so I just made up a quick pattern with painters tape. There isn’t any specific method that I used. I just cut the tape pieces and stuck them together at 90 degree angles across the runner. Like I said, I was going for easy here. I mixed 1 part fabric medium with two parts of Martha Stewart metallic paint in copper and then dabbed it on with a sponge. I peeled up the paper and, voila! 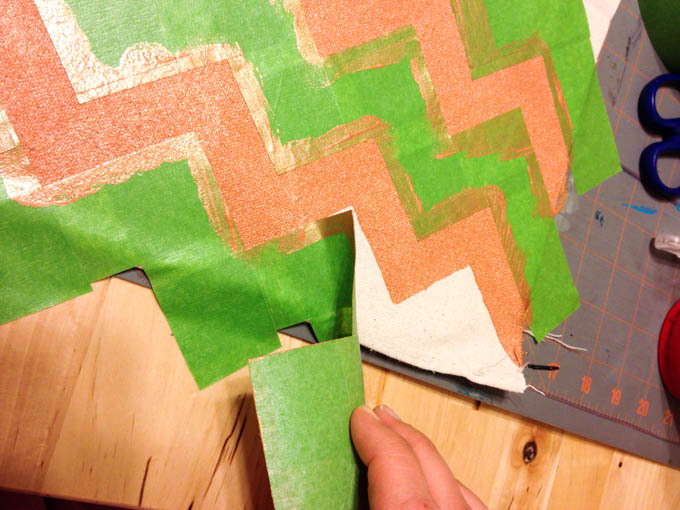 I made sure to peel the tape up in one piece, so I could just stick it down when I painted the other side of the runner. Here’s the finished centerpiece. 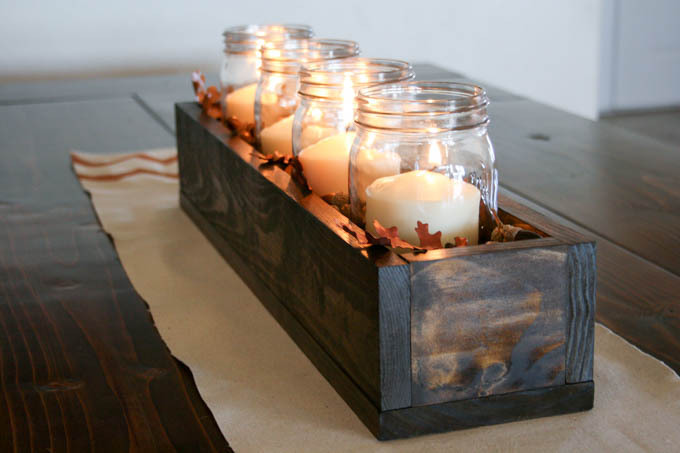 I used quart-sized mason jars with 3″ pillar candles. The candles were a bit too tall, so I just cut an inch or so off of the bottoms of them with a chef’s knife. I filled the box with acorns and leaves that I had collected while we were camping up in the mountains a few weeks ago. The leaves were a beautiful gold color when I picked them, but turned a yucky brown color a few days later so I decided to give them a little metallic flair as well. I really love how it turned out. It was exactly how I had pictured it. I can’t wait to get started on some other fall projects once the craziness of Halloween is over. 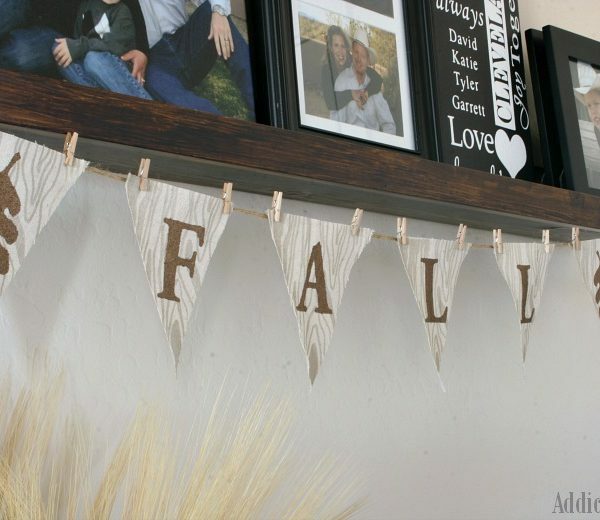 What are some of your favorite fall decorations? I’d love to hear them! I’ll definitely do that when I get back to my computer:) Thanks! 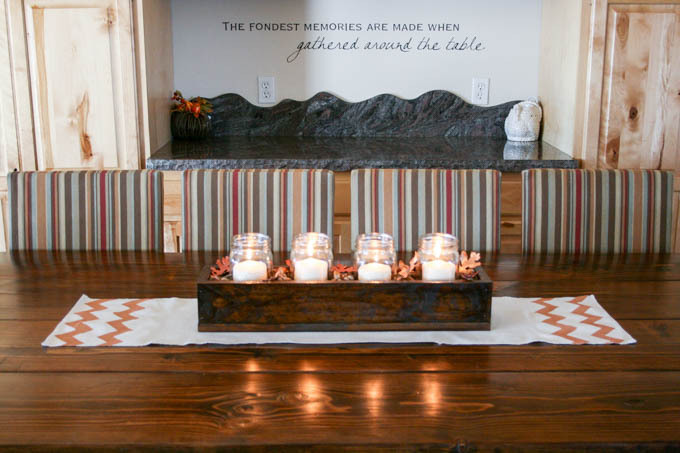 Love the centerpiece… And the table! Your table and centerpiece are beautiful! 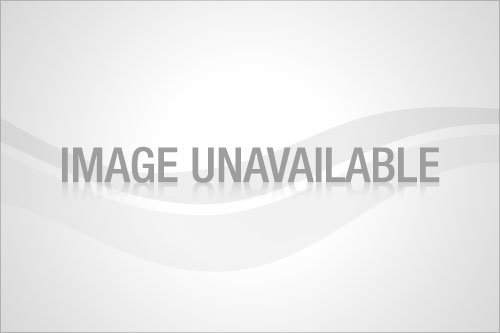 You have inspired me to try it myself….thank you! I would love it if you would link up at Martha Mondays, open now through Wednesday night! Featured this weekend at Friday Favorites! Would love for you to link up a new favorite!!! I love this centerpiece! I’m always a fan of simple centerpieces. I’m going to try my hand at a hand painted table runner for the holidays, thanks for the inspiration! Absolutely love this box! I guess I know have a project for my husband! 🙂 Can’t wait to do this, I might even do it for the christmas season too! 🙂 Pinning! I just adore how this turned out! Perfection. Simple and stately. 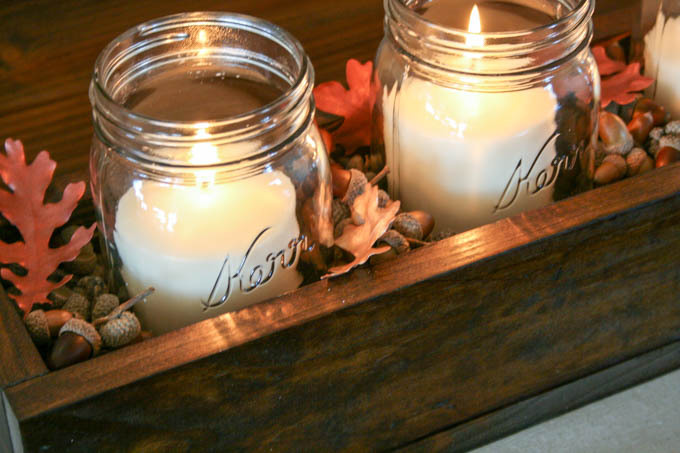 Thanks so much for linking up at our holiday mason jar party! Thank you! I will be sure to link up! Love this! 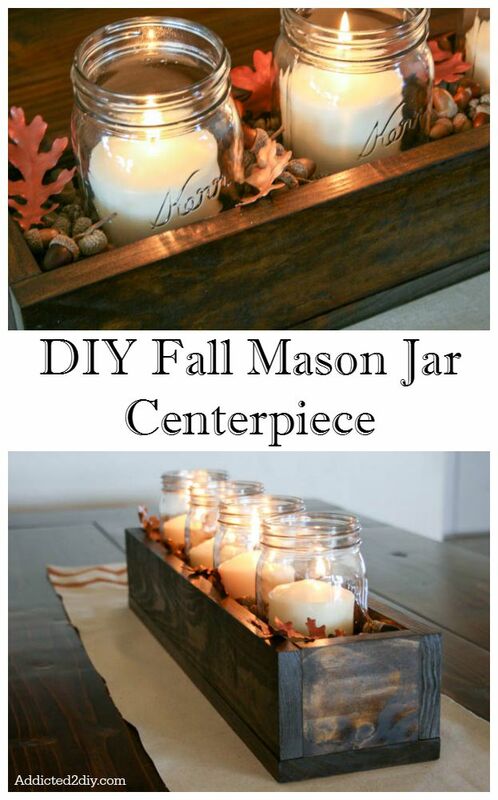 What size are the mason jars? Where did you get the candles, and what size? I’m going to show friends how to make this at a craft party! What a great idea! Did you put polyurethane on box? No, but you certainly can if you’d like to seal it.